Mozambique now faces new challenges. These include contentious loans, debt-disclosure controversy and increasing violence between forces of the FRELIMO (Mozambique Liberation Front) government and its former civil war adversary turned opposition party, RENAMO (the Mozambican National Resistance). Is it still convincing to frame Mozambique’s peacebuilding process as a success? Is it still convincing to frame Mozambique’s peacebuilding process as a success? Does the current crisis signify a failure of the peace in Mozambique – or will this period merely be a temporary, albeit serious, setback? A recent paper released by the Institute for Security Studies (ISS) places these challenges in context by assessing the peacebuilding of the past 24 years. Mozambique’s peacebuilding plans can be categorised according to five interlinked areas: security, economic foundations, inclusive politics, justice, and revenues and services. Peacebuilding is by nature complex and lengthy, which makes it difficult to define and measure. As such, there is little consensus among peacebuilding practitioners and analysts as to what constitutes successful results. Political violence in recent years confirms, however, that Mozambique’s peacebuilding process is still incomplete. Lessons for peacebuilding planning, however, may be taken from how national resilience has developed – either by design or by chance – to prevent the country from relapsing into large-scale civil war. Mozambique has developed increasingly comprehensive peacebuilding plans, a result of the expanding capacity of the government over time to develop strategies. Several strategies, including official poverty-reduction strategies and five-year government plans, have provided a degree of policy direction, as well as links between peace and development. The justice sector, however, has lagged in building its capacity to prevent conflict. Missed opportunities for coordinated planning efforts – for example between the United Nations and civil society to strengthen the police’s capacity – have hindered the role of judicial reform in peace consolidation. Another challenge is the country’s capacity to ensure accountability and monitor strategy implementation. 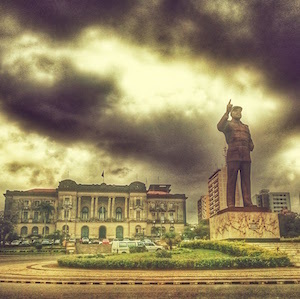 Metrics for macro-level socio-economic plans, for example, have not stemmed particularly from within the Mozambican government, but rather were largely initiated at the behest of donors insistent on increased oversight. Major plans such as Agenda 2025 and the National Development Plan (2015–2035) are visionary in their approaches to reducing poverty and developing a peaceful society, but offer limited measurable implementation. This does not mean that gaps in implementation, monitoring and evaluation are due only to a lack of political will. Technical-planning capacity is still being built, and various Mozambican ministries have made a concerted effort to dedicate resources. Civil society has played a flexible and critical role in brokering peacebuilding responses, often using the gaps left by a lack of coordinated approaches. The Mozambican Force for Crime Investigation and Social Reintegration and JustaPaz, for example, were established given the need to continue the UN-initiated disarmament, demobilisation and reintegration process after the UN Operation in Mozambique departed in 1995. While this somewhat ad hoc response to filling gaps points to some flexibility in responding to emerging challenges, it also signals a lapse in planning and implementation capacity. The current crisis in the country further highlights the importance of longer timelines when planning for peace. In the years following the 1992 Rome General Peace Agreement, which ended the decades of conflict, the appetite for peacebuilding activities and discourse became limited both among international donors and Mozambican society. Donors, for instance, eventually pressured civil society organisations to move away from peacebuilding to focus more broadly on economic development. It is understandable that the country would favour other forms of progress. But while optimism and a forward-thinking perspective are valuable, this must not come at the expense of important peacebuilding processes. Longer timelines and sustained international and domestic support would have aided Mozambique’s consolidation of peace. Notably, the disarmament, demobilisation and reintegration of ex-combatants has been a critical challenge since Mozambique’s transition from conflict. Recent violence may, in part be traced to a lack of a comprehensive and consistent support for this process. The long-term nature of building peace is often constrained by short-term realities, a finding repeatedly stressed by the ISS. The success of Mozambique’s post-civil war peace is now threatened by short-term political and economic ambitions and increased violence. While the country continues to display a degree of resilience against relapsing into civil war, Mozambique’s leadership must not compromise stability for the sake of political and economic gains. Mozambique’s peace has not failed, but it is being threatened by critical systemic problems. These challenges to peace are likely to persist given political tensions within FRELIMO and the country as a whole, as well as the country’s debt crises and stalled natural gas revenues. The peacebuilding processes developed in the post-civil war period have created some resilience in society, but far more must be done to ensure that peace is sustained. Peacebuilding is a broad and lengthy process. Rather than simply silencing the guns, it needs to focus on creating the conditions that drive and sustain peace. To be effective, peacebuilding needs to be based on developing plans and responses that continuously support a country over a longer term. This might be the most important lesson provided by Mozambique.